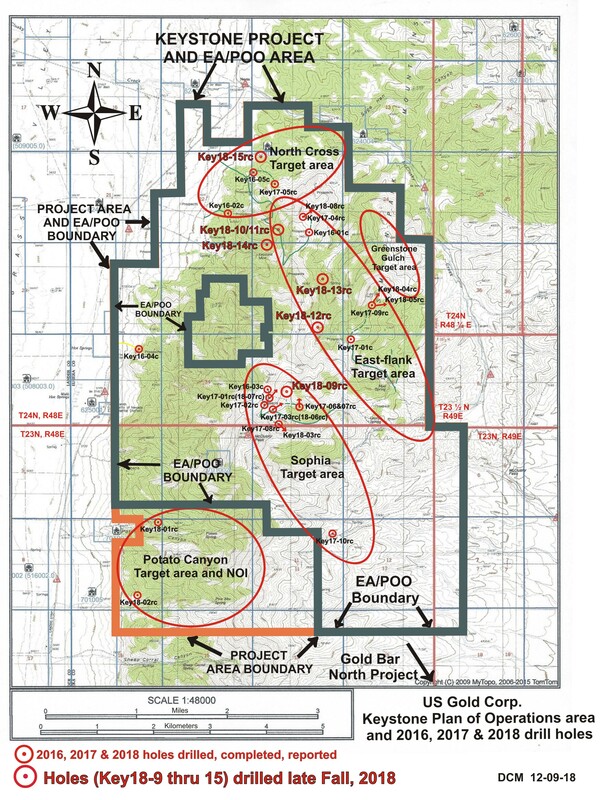 ELKO, NV, December 6, 2018 — U.S. Gold Corp. (NASDAQ: USAU - http://www.commodity-tv.net/c/search_adv/?v=298678 ), a gold exploration and development company, is pleased to announce the pending completion of the late Autumn 2018 drilling program at its 20 square mile, Keystone project, in Nevada’s Cortez Trend. This drill program is testing several quality drill targets in areas of completed detailed geology, surface geochemistry, geophysics, and target synthesis. Up to this point in time, the bulk of the Keystone project area was inaccessible to drilling exploration because of severely limited surface disturbance restrictions of about 5 acres per 4 square miles of area. The Keystone Environmental Assessment (EA) and Plan of Operation (POO) were approved by the Bureau of Land Management (BLM) on September 7, and subsequent archeological surveys preparatory to road and site building were signed off by the BLM and Nevada Department of Environmental Protection (NDEP). Access and the drill sites were constructed, and drilling the six new sites is in progress.